Conducive Space for Peace (CSP) is a collaborative partnership that explores how to effectively promote sustainable peace and bring about institutional change in the international system of peacebuilding support. It works through developing and supporting new and innovative ways of collaboration among stakeholders in international peacebuilding and development financing institutions and organisations at regional, national and local levels. It gathers evidence and catalyses new ways of working to support peacebuilding and to shift from rhetoric to new practice. With the finalization of the ‘incubator phase’ of CSP, we stand on solid ground to lay the foundation for the future. The period from January to July 2019 will function as a ‘bridging phase’ where we revisit the organizational set-up and the strategic direction of CSP in order to develop a longer term engagement and a sustainable organizational structure. The main goals for the ‘bridging phase’ are to develop a three-year strategy for CSP, to develop the appropriate institutional framework required to implement it, and to further develop the momentum for change through strategic engagement with key stakeholder groups. Among the key strategic questions we will be exploring are: How to facilitate systemic transformation including how to strike the right balance between accompaniment and disruption, between strategic engagement with key change makers and broader mobilization for change, between focusing on structural, attitudinal, and behavioral change, and between pursuing change through systems innovation and systems transformation paths. One of the concrete activities we will undertake during the ‘bridging phase’ is a meeting in New York end of April 2019 with likeminded organisations who are all, from different perspectives, pursuing change in the international system of support to peacebuilding. 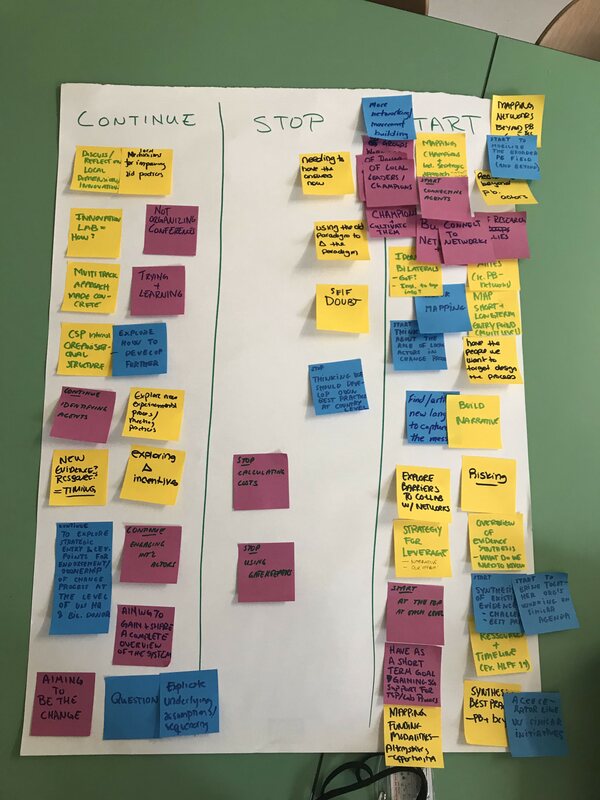 We will create a space for sharing the learnings and best practices from each our change efforts, get inspiration for different ways of thinking about and acting on systemic change, and we will explore the scope for jointly pursuing this agenda. The bridging phase is supported by and conducted in partnership with Humanity United. 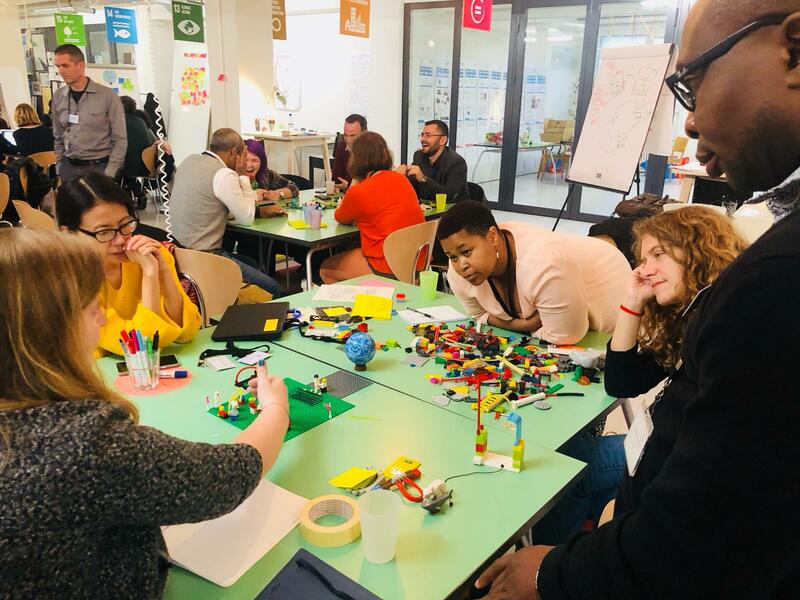 The Conducive Space for Peace Accelerator was held in Geneva, Switzerland during Geneva Peace Week from November 5th till November 8th 2018. The main part of the process was a four-day workshop bringing together cohort teams working in different conflict-affected contexts on innovative practices in international-national collaboration on peacebuilding. The Accelerator gave practitioners a space to reflect and act together as a team in order to ‘accelerate’ their initiative and the broader changes it represents. 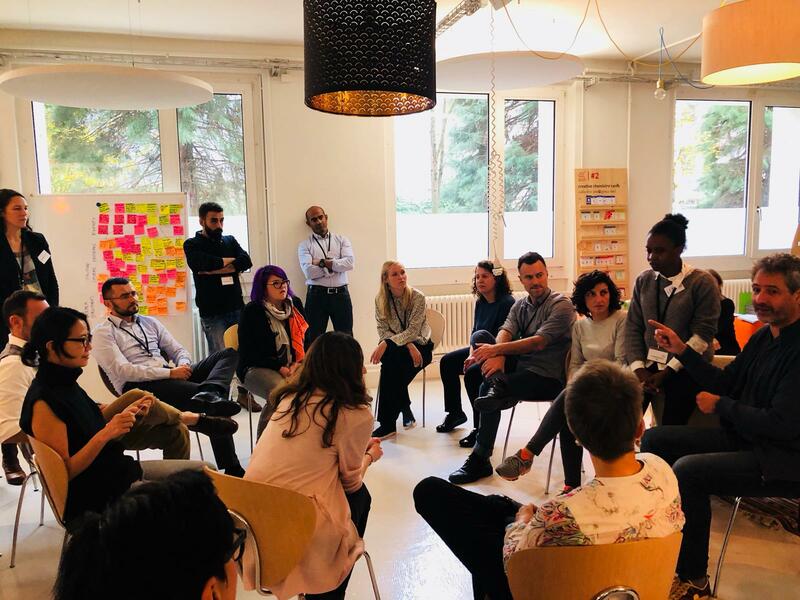 Teams went on learning journeys, got inspiration and new insights from other cohort teams and team members, and connected with the activities and energy of Geneva Peace Week. Each cohort team was composed of participants representing innovative partnerships between international organisations (UN agencies and other), local government, international and national NGOs and other relevant actors involved in collaborating around and developing new practice. Five teams worked on issues such as enabling locally owned youth-led dialogue platforms in Bosnia and Herzegovina, strengthening local digital innovation in peacebuilding in Syria to enable broad and deep participation in high level change processes, placing the local population at the center of the peace-building system in Mali through systemic action research, and supporting and accompanying young female peace leaders in playing effective roles in peace building in South Sudan, Liberia, and Nepal. Also, a Conducive Space for Peace team worked alongside the other cohorts to explore how to transform the current international system of support to national/local peacebuilding in order for it to support a conducive space for collaboration on sustainable peace. International advisors – Gay Rosenblum-Kumar from Peace Direct and Non-Violent Action (NY), George Varughese from Niti Foundation (Nepal), Sweta Velpillay from CDA (Sri Lanka), Catriona Gourlay from Peace Nexus (Geneva), Jenny Aulin from IPTI (Geneva) worked with the CSP cohort to challenge and advance the thinking. 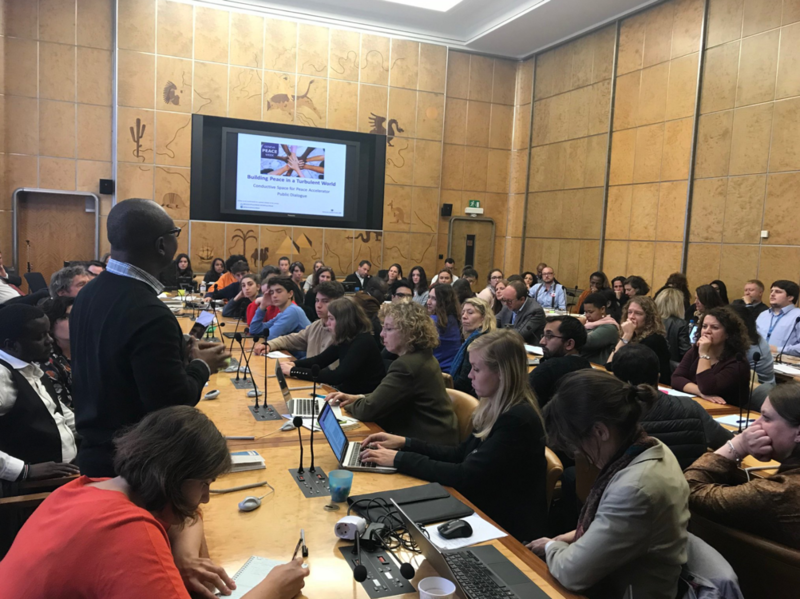 A public event was held on November 8th at Palais des Nations to share the challenges that cohort teams were trying to address in the different conflict affected contexts, and the insights and new strategic direction which had been sparked by the Accelerator. The event represented an alternative to the typical UN-led panels and discussions, and gave an inspiring glimpse of the energy and wisdom that lies at the heart of national/local peacebuilding work, and gave food for thought on the urgent need to change the international support system to be more conducive for supporting local peacebuilding efforts. Since its initiation the Conducive Space for Peace initiative has engaged broadly with multiple stakeholders within the peacebuilding support system. Within the Incubator phase consultations have been ongoing at both headquarters, regional and country level, with an intense engagement in April 2018 with key stakeholders of UN agencies, diplomatic missions, INGOs and others in New York. 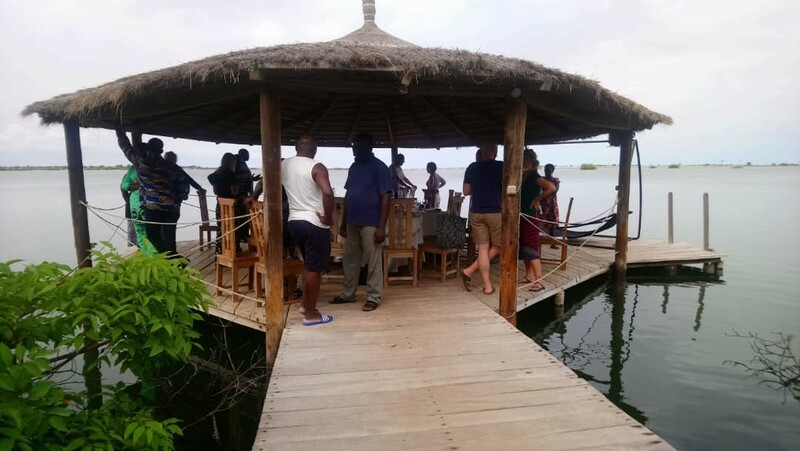 The purpose of this trip was to ascertain where interest for collaboration lies, which agencies to collaborate with, and what such collaboration could look like in practice. It was also an effort to ensure that when in-country work commenced there would already be links to UNHQ. We also gained a deeper understanding of the roles of various UN agencies, bilateral agencies, and peacebuilding-oriented NGOs in practically supporting the ‘Sustaining Peace’ agenda. During the April visit, the CSP representative attended the President of the UNGA’s High Level Meeting on Sustaining Peace. 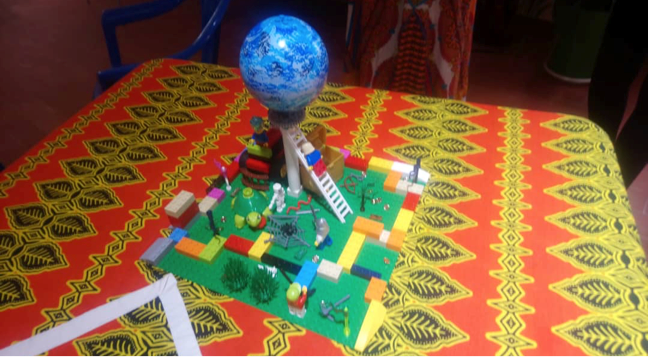 A critical element of the Conducive Space for Peace initiative is to explore and develop ways of enhancing the effectiveness of international support to national level peacebuilding, and to use the national level experiences to inform broader transformation of the international peacebuilding infrastructure. 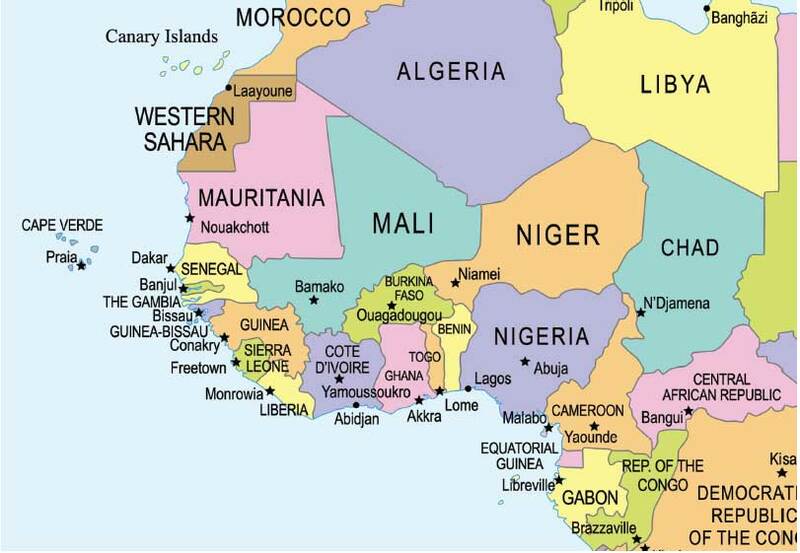 In the summer of 2018, exploratory visits were conducted in Mali, Liberia, and Sierra Leone. Questions explored with key stakeholders at national level included: What would an institutional framework for peacebuilding support look like that is better fit for supporting national actors in sustaining peace and preventing violent conflict? 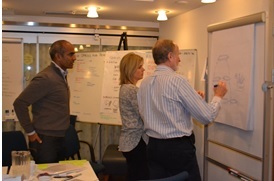 What are the challenges of the current system, and what are some good alternative practices already being explored? How can actors within and beyond the peacebuilding architecture promote systemic changes that create a more conducive space for peace? In addition to the country level consultations, a West Africa regional workshop was held in Senegal with the UN Peace and Development Advisers from country offices within the region, representatives from the Department of Political Affairs (DPA) and other UN bodies, as well as representatives from Oxfam and other international organisations working in West Africa. The critical position of these advisers and the insights to the international system for support to peacebuilding that they hold, will be an important cornerstone in the future engagement of CSP. Consultations showed a very strong interest in the issues raised by CSP, from UN agencies, Oxfam country offices, civil society organisations and some elements of government, in each of the countries visited. There is a sense of a deep understanding and experience of the systemic challenges that CSP aims to address, and a commitment to being part of the CSP process. 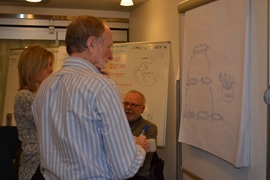 The consultations provided new insights on systemic challenges and created new perspectives on the way forward to facilitating systemic transformation. The initiative takes a two-pronge approach to analysis and learning. It focuses on the one side on analysis of the peacebuilding system (the external analytical track): understanding the challenges in the international system of support to peacebuilding, understanding processes of systemic transformation in such systems (including opportunities and barriers to change), and understanding what has worked so far in trying to facilitate systemic transformation. And it focuses on analysis and learning that can be drawn from the CSP initiative itself (an internal track) in relation to the approaches, processes, and other enablers of success in the initiative. 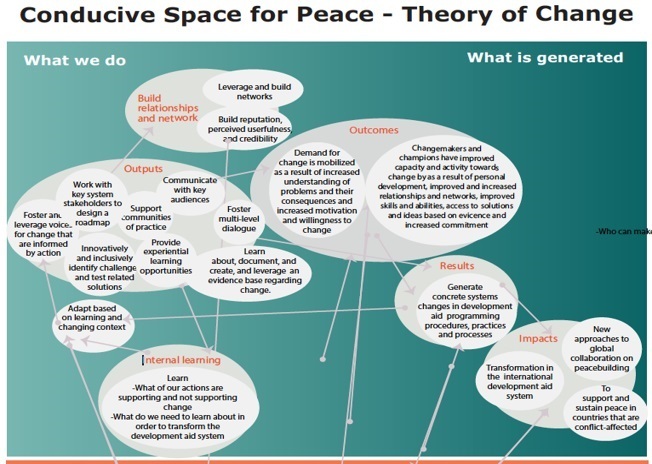 The purpose of the CSP learning component is to ensure that activities within the initiative effectively advance the goals of the initiative, and ultimately facilitate changes in the international peacebuilding system. CSP is engaging in learning by applying an action-focused, experimental, critical and evidence-informed learning approach by implementing reflective and adaptive practices and experiential learning opportunities. 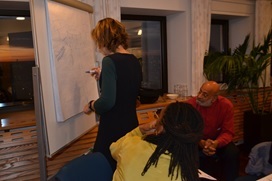 On November 28th – 29th 2016, the Centre for Resolution of International Conflicts (CRIC – University of Copenhagen) and Conducive Space for Peace hosted a two-day workshop ”Towards Conducive Space for Peace” with participation of expert scholars and practitioners Ambassador Ibrahim Gambari, Mille Bøjer, Mariama Conteh, Bjørn Førde, Firoze Manji, Michelle Parlevliet, Gay Rosenblum-Kumar, Chris Spies, George Varughese, Peter Woodrow and Mie Roesdahl. The workshop evolved around the key challenges in international support to peacebuilding, what we can learn from the peacebuilding efforts that have proved to work, what other related reform agendas are important and how to relate to these agendas, how to drive a global transformative agenda through innovative and mainstream processes, how to secure support and ownership from key stakeholders both at the global policy level and at the local level in conflict affected countries, and how to develop and engage research that provides new knowledge and perspectives. 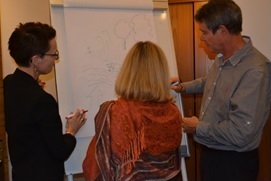 As the project seeks to take a different approach and engage actors in different ways than what has been done before, methods and approaches such as Transformative Scenario Planning, Social Labs and X-Divisions was discussed as possible (new) ways to transform the systemic conditions for peacebuilding. Peacebuilding initiatives and interventions are often event-based, short-term and tend to focus on urgent issues rather than long-term perspectives and root causes. The prioritisation of funding e.g. the funding allocated to respectively peacekeeping, peacebuilding, prevention and that interdisciplinary funding is difficult to get. 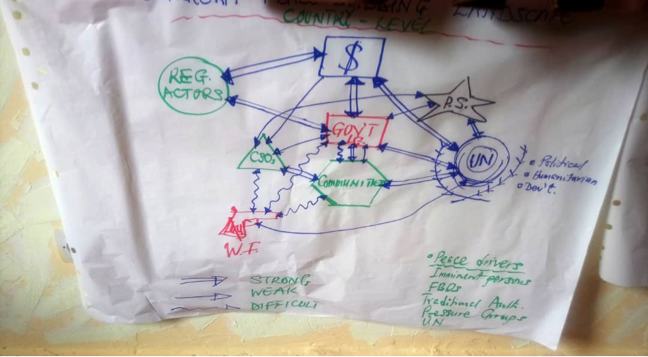 Peacebuilding efforts lack coordination: A case in example is UN Resident Coordinators who often do not take up the role as the lead in coordination. Working across levels is important, however, the question remains who to do it. 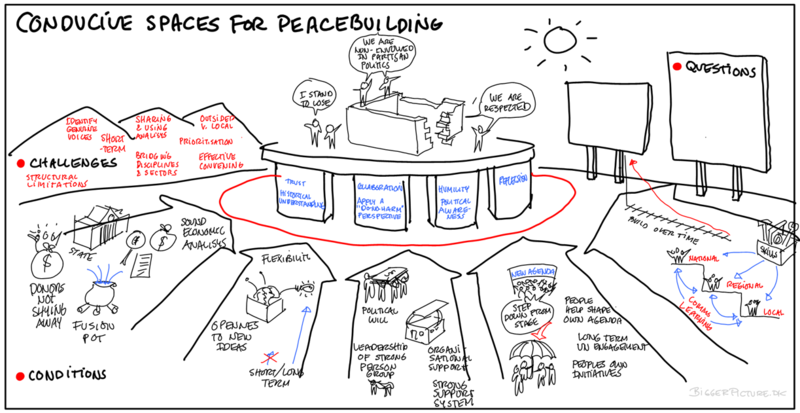 The way organisations are structured is not conducive for people working towards peace. Unilateral ways of working was highlighted as an issue in terms of power, politics and top-down structures. The challenge of identifying who the genuine representatives and bridge builders at the local level are (often challenged by certain ideas about “real” authenticity) and how to engage in a common understanding of these among private actors, NGOs and governments. The dynamics between local and international – a challenge in the trade-off between international efforts and contextual efforts, a tendency to neglect the local at the expense of the international. However, a concern was also raised in terms of romanticising the local, as local actors can be problematic as well. 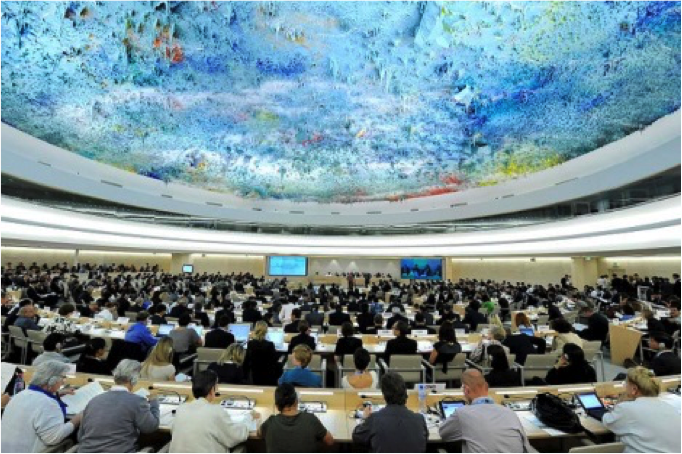 The tendency among INGOs to ignore governments and solely engage with civil society. However, it was also considered problematic that the UN and the North is often criticised for not including civil society, while there is a tendency not to criticize the global south nations when not including civil society either. Challenges in changing practices: there is a continued focus on flexibility and adjustability in programs, but little action is taken to implement these changes in practice.